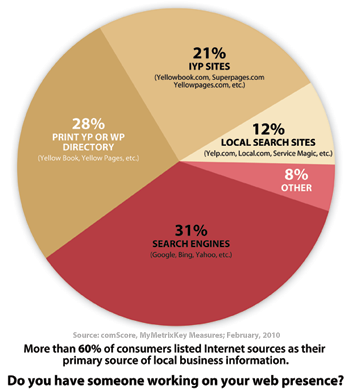 More than 60% of consumers say that the internet is their primary source of Local Business information. Do you have someone working on finding these customers? Search Engine Optimization can be performed on any website, but for the best results you should build a website with the SEO "baked in." Designing a site from the ground up to rank well in popular search results is the best way to attract new customers to your website. Web SBZ sites are built after carefully researching which keywords are important to your business and designed and coded to be SEO friendly. Investing in an optimized website will pay for itself in new business, but even the best optimized websites need constant work to attract new customers. Google ranks websites based on link popularity, so a well optimized may not rank well because there are very few links to establish its online credibility. For this reason we have partnered with Boom Visibility who offers affordable packages to market your website. They handle everything from SEO, to link building, to social media and pay per click advertising. Because our sites are built with SEO in mind our customers qualify for a 50% discount on the down payment for any Boom Visibility Internet Marketing Package.